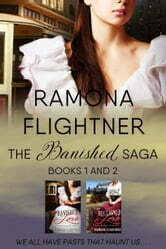 Immerse yourself in the first two novels of the Banished Saga, where romance, honor, a duty to family, and a desire to live a fulfilled life play out against the backdrop of turn-of the century Boston and Montana. NO cliffhanger when read together. To living a life she desires with the man she loves, Clarissa Sullivan continues to teach poor, immigrant children and to agitate for the vote for women as she awaits Gabriel’s return to Boston. Will her stepmother leave her in peace or is her life about to change again in unforeseen ways? Clarissa is the woman he now wants to marry, Cameron Wright renews his pursuit of her. Charming, wealthy and well-bred, he is perceived as the ideal gentleman for a blacksmith’s daughter. With Gabriel far from Boston and his return uncertain, why should Clarissa continue to reject Cameron? After his banishment from Boston, Gabriel McLeod forges a new life in a remarkable city. Will the memories of the love he shared with Clarissa sustain him? Will Clarissa overcome deceit and treachery and reclaim her love?